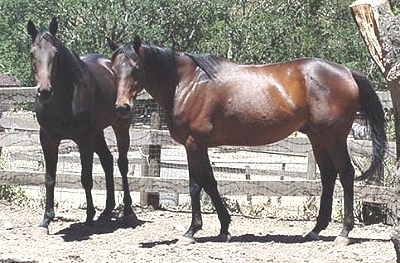 1984 Dark Bay Standardbred Gelding “Joe” is a Standardbred that has been ridden, but prefers to be driven. 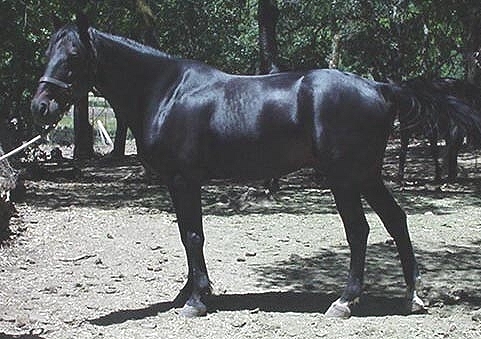 He rules over the other horses in his pasture – all Thoroughbreds, and is really “bomb-proof”. 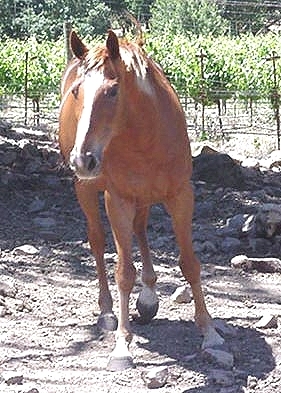 1994 Chestnut Thoroughbred Gelding “Frenchie” arrived at the farm with a fractured sesamoid, which has long since healed well. His flaxen mane and tail make him a striking individual. He and his paddock-mates do a lot of playing around. 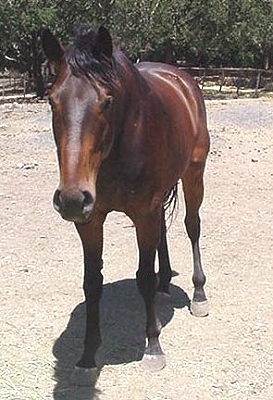 1988 Bay Thoroughbred Gelding “Bugsy” got his nickname from his white eye. 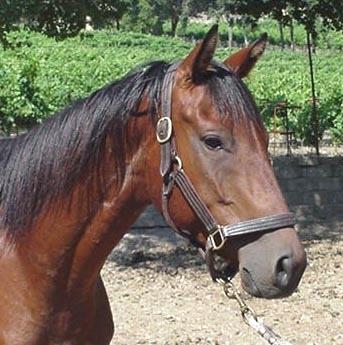 He raced and won several times in Oregon before he was retired with a fractured sesamoid. He has long since recovered and retired and spends his days the way many of us would like to – with no stress. 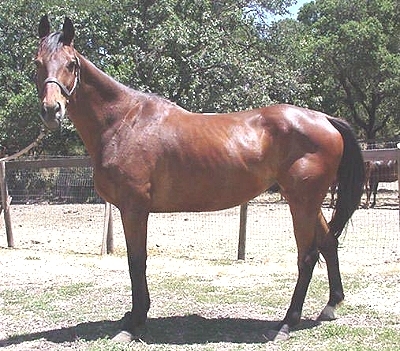 1998 Bay Thoroughbred Gelding Speedy has a chip in his knee, but it doesn’t seem to bother him now that he’s not racing. He’s a fairly small horse in size and bone, but nobody told him that. He enjoys challenging his companions to a game of almost anything, and usually comes out ahead. 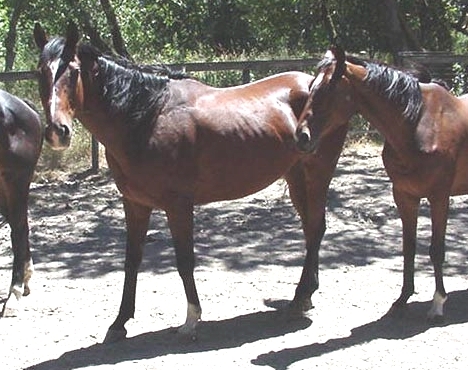 1996 Bay Thoroughbred Gelding “TP” had a bowed tendon that caused his early retirement from racing. He’s healed and sound, enjoying his life of leisure and not sure if he really wants to relinquish his idle time for a second career. 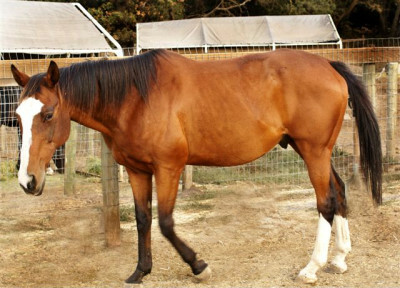 This horse arrived at the farm as a still growing three year old with a bowed tendon. He has grown indeed – to well over 17 hands. He’s earned himself the title of “Fonzy” due to his “cool” alpha attitude which dominates those around him. He definitely seeks to be the center of attention. Fonzy is retired.